At the center of the infrastructure legislative debate is identifying a sustainable source of funding for big-ticket construction and maintenance projects around the country. A federal account that assists states with those projects will be insolvent in about two years, according to analysts. The account relies on insufficient revenue from the fuel tax. That rate — 24.4 cents per gallon for diesel, and 18.4 cents per gallon for gas — has not been raised since the Clinton administration. The leadership of the House Democratic caucus currently in the majority says it will offer an infrastructure proposal as early as May, which White House officials say they will review. Chao conceded a private sector-centric infrastructure measure the White House had pushed in 2018 lacked requisite support for advancement. That year, President Donald Trump’s Republican party controlled each chamber. This year, Trump has insisted he would be willing to deal with Democrats to advance long-term infrastructure policy. House Speaker Nancy Pelosi (D-Calif.) recently indicated her leadership team was prepared to pass that type of legislation with the president, while Senate Republican leaders have yet to announce their plans. Meanwhile, nearly every transportation stakeholder is calling on federal policymakers to commit long-term funding for the country’s infrastructure. Several groups, such as the U.S. Chamber of Commerce, are endorsing raising the federal fuel tax. A recent report by the American Road and Transportation Builders Association that relied on federal data determined that more than 47,000 bridges are structurally deficient. The American Society of Civil Engineers in 2017 issued a “D+” grade for the country’s infrastructure. 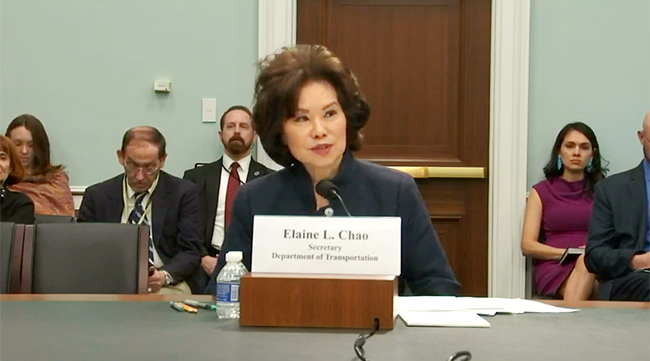 At the hearing, Chao also touted the president’s fiscal 2020 budget request for DOT. She praised the administration’s attention to infrastructure grants for projects of regional significance and freight programs. The request is calling for $1 billion for the Better Utilizing Investments to Leverage Development (BUILD) grants, formerly TIGER grants. It also seeks $2 billion for Infrastructure for Rebuilding America, or INFRA, grants for freight projects. The overall request for DOT in fiscal 2020 is 22% less than last year’s enacted level, according to the Office of Management and Budget. FMCSA would receive $288 million for safety operations and programs, and $387.8 million for safety grants. The FMCSA request is higher than the fiscal 2019 enacted level of $284 million for safety operations and programs, and $382.8 million for safety grants. Republicans on the panel applauded the White House’s emphasis on infrastructure grants. Democrats also welcomed the attention to such grants, while criticizing cuts to rail and transit accounts.